(Nanowerk News) The Hall effect, discovered in 1879, is observable when a Hall voltage perpendicular to the current is produced across a conductor under a magnetic field. Although the Hall effect was discovered in a sheet of gold leaf by Edwin Hall, this effect does not require a two-dimensional condition. 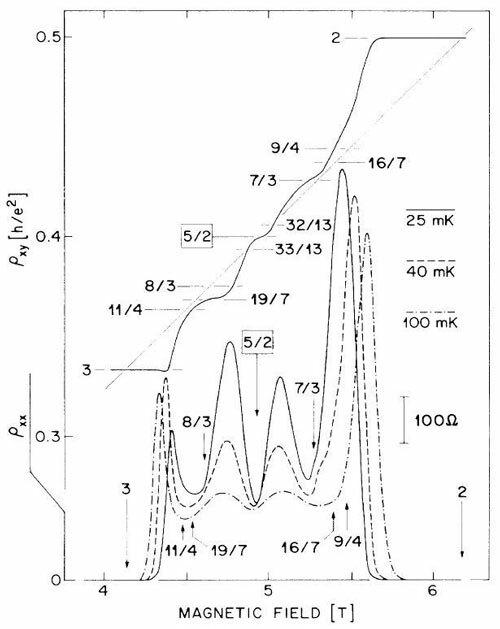 A century later, in 1980, the quantum Hall effect (QHE) was observed in two-dimensional electron gas (2DEG) system. The QHE occurs when a two-dimensional electron gas is exposed to a very low temperature and a very high magnetic field. The classical Hall resistance becomes quantized numbers in QHE. Usually, electrons are confined in a GaAs-AlGaAs interface potential well, formed by the two semiconductors with band offset. The fractional quantum Hall effect (FQHE) was discovered in 1982. FQHE has almost the same characteristic as the QHE, with the Hall resistance quantized as h/e2 over a fraction. The first fraction observed is 1/3. Many theoretical and experimental efforts continue in the field of the FQHE. Scientists at Peking University's International Center for Quantum Materials outline previous research and recent discoveries and technical developments in the field in a new paper , "Recent Experimental Progress of Fractional Quantum Hall Effect: 5/2 Filling State and Graphene", published in the Beijing-based journal National Science Review. The 5/2 filling factor state is special for being an even denominator state, since most of the previously observed fractional quantum Hall states have odd denominator fractions. The observation of the 5/2 state demands new theoretical concepts. This even denominator fractional quantum Hall state can be viewed as a new testing ground to study complicated many-body physics involving simple electrons. Their paper covers the progress of the 5/2 state in terms of energy gap, spin polarization study, fractional charge and statistics. The relationship between the energy gap and other experimental parameters, such as electron density, mobility, sample quality, are outlined. The confusing results of spin polarization and the interference experiments are also reviewed. The Peking University scientists acknowledge in the paper that the "5/2 state needs extra efforts to determine its ground state wave function." The paper's co-authors likewise survey recent progress in researching FQHE in monolayer graphene. Graphene has gained increasing scientific attention due to its peculiar band structure, corresponding two-dimensional massless Dirac-like excitations and great application potential. The quantum Hall effect in graphene has even been found at room temperature, which makes QHE-based applications more attractive and likely to become a focus of research in the future. The FQHE has been observed in graphene since 2009. Typically this effect has been studied in semiconductors and graphene as a new platform for two-dimensional electrons. FQHE in graphene provides an interesting platform for experiments in many-body physics.